Joe Chlapaty is a numbers guy. Having worked his way up the corporate ladder through accounting and finance, he’s wired to use percentages and ratios to analyze everything, including his health. Joe has a type of irregular heartbeat known as atrial fibrillation, or AFib. He underwent a procedure called an ablation to fix the problem spots in his heart, and he now controls it through medication and with a pacemaker to stabilize a slow heart rate. Periodic reviews of Joe’s cardiac performance show that he’s settled into a pattern of AFib occurring only 1 percent of the time. His cardiologist is pleased. Joe is also a man of action. So he’s doing what he can to avoid that worst-case scenario for everyone who has AFib. 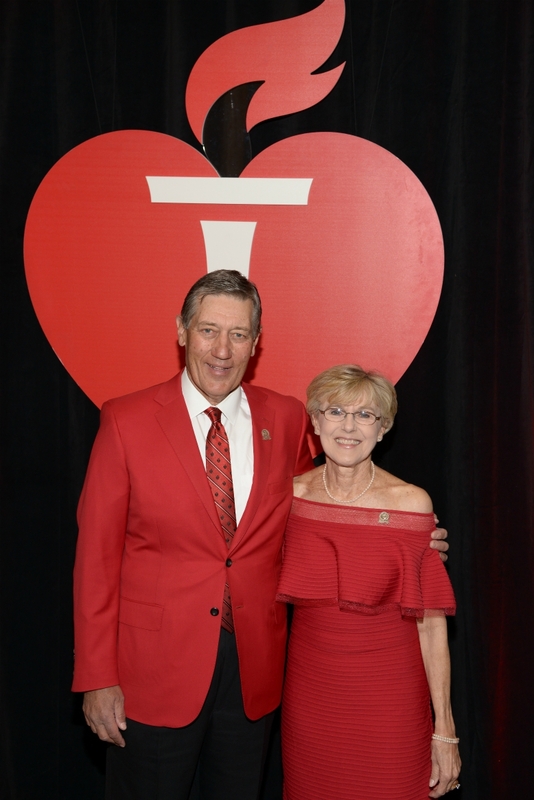 Joe and his wife, Linda, have donated $6.25 million to my organization, the American Heart Association, with the majority of it earmarked for AFib research. It’s part of a $15.75 million philanthropic investment into this condition, and part of more than $28 million in recently announced research grants. Another thing Joe is doing: Volunteering to be one of the patients studied by researchers. “I want to learn more about what it is, how it happens and what can be done about it,” he said. What is AFib? This screenshot comes from the AHA’s Watch, Learn and Live interactive library. AFib is a quivering in the heart’s upper chambers. Each episode increases the risk of blood clots. If not treated, AFib doubles a person’s risk of a heart-related death and raises fivefold the risk of a stroke. An estimated 6.1 million people in the United States are living with AFib, making it the most common heart abnormality in the country. The number of patients is expected to essentially double by 2030. Research into prevention and treatment are the best tools to fight it. Fortunately, benefactors such as the Chlapatys and Sally and Bill Soter are helping make that possible. The investments are going into a new Strategically Focused Research Network targeting AFib. Strategically Focused Research Networks, or SFRNs, are collaborations among several elite institutions. Each institution in the network focuses on different aspects of a shared theme. Our other SFRNs focus on prevention, hypertension, health disparities, women’s hearts, heart failure, obesity, children and vascular disease. As this graphic below shows, work is being done across the country. Before Joe launched his business career, he played college football. That eventually led issues with his knees and shoulders. Everything else was in good shape until the day in 2011 when a “feeling of doom” spread across his body. It was as if something serious had occurred, but he didn’t know what it was. Linda was in the other room, so he called for her. She brought him a glass of water and had him sit down. He felt weak for several days but didn’t do anything about it. Then came cluttering in his field of vision a few days before a trip to Italy. So began a journey that took him from optometrist to ophthalmologist to an emergency room to heart hospital. A series of tests showed that he’d suffered a stroke probably caused by AFib. Doctors cauterized some nerves in one of his heart’s chambers (known as an ablation procedure) and implanted the pacemaker. By then, Joe was president, chairman and CEO of Advanced Drainage Systems, Inc., in the Columbus, Ohio, area. Before being diagnosed with a heart problem, he’d considered getting involved with his local AHA office but felt he didn’t have the time. Then Joe retired in September 2017. He chaired this year’s Columbus Heart Ball and learned more about the organization’s reach. “The more I learned, the more interested I became,” he said. Joe and Linda donated $5.5 million for the AFib SFRN and $750,000 to fund local initiatives such as awareness of heart disease and CPR training. He also accepted a seat on his local AHA board. In 1998, Sally and Bill Soter were getting ready for a trip when she didn’t feel right. A walk up a hill left her breathing hard, followed by an ache in her side. Thinking it might be appendicitis, Bill got her to a doctor. The diagnosis: AFib. As she’s worked to get her condition under control, and dealt with the related stress, she’s also become a crusader in the fight against heart disease. Or, rather, she’s continued her family’s tradition of doing so; the heart hospital at Ohio State University is named for her father. In 2005, Sally endowed a chair in women’s cardiovascular health at OSU. In 2011, she donated $5 million to set up our women’s health SFRN, the Sarah Ross Soter Center for Women’s Cardiovascular Research. Sally (whose full name is Sarah Ross Soter) monitors the progress of that network. Her radar is always attuned for issues related to the fight against heart disease, especially her condition. Sally and Bill donated $5.2 million toward the AFib SFRN. The Sarah Ross Soter Center for AFib will be based at the Cleveland Clinic. It will focus on questions in AFib care, seek new therapies and test behavior change programs that show promise in preventing symptoms from getting worse. The center named for the Chlapaty family has a slightly different structure. This center will be home to a “DECIDE Center” for AFib patients. The DECIDE acronym stands for Decision-making and Choices to Inform Dialogue and Empower. DECIDE Centers test and deliver tools for doctors and patients to work together to decide the best treatment plan. The Joe and Linda Chlapaty DECIDE Center will be at Stanford University. Another DECIDE Center, established through our Patient-Centered Outcomes Research Institute (also known as PCORI) and a gift from AHA national board member David Spina and his wife, Stevie, will be at the University of Utah. Other centers in this SFRN will be at Boston College, Northwestern University and Vanderbilt University.